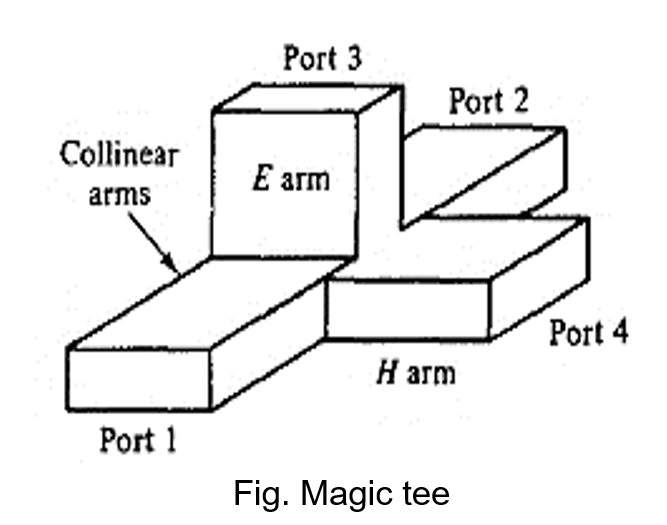 Question: Magic Tees (Hybrid Tees). If two waves of equal magnitude and the same phase are fed into port 1 and port 2, the output will be zero at port 3 and additive at port 4. If a wave is fed into port 4 (the Harm), it will be divided equally between port 1 and port 2 of the collinear arms and will not appear at port 3 (the E arm). If a wave is fed into port 3 (the E arm), it will produce an output of equal magnitude and opposite phase at port 1 and port 2. The output at port 4 is zero. That is, 543 = S34 = 0. The magic tee is commonly used for mixing, duplexing, and impedance measurements. Suppose, for example, there are two identical radar transmitters in equipment stock. A particular application requires twice more input power to an antenna than either transmitter can deliver. 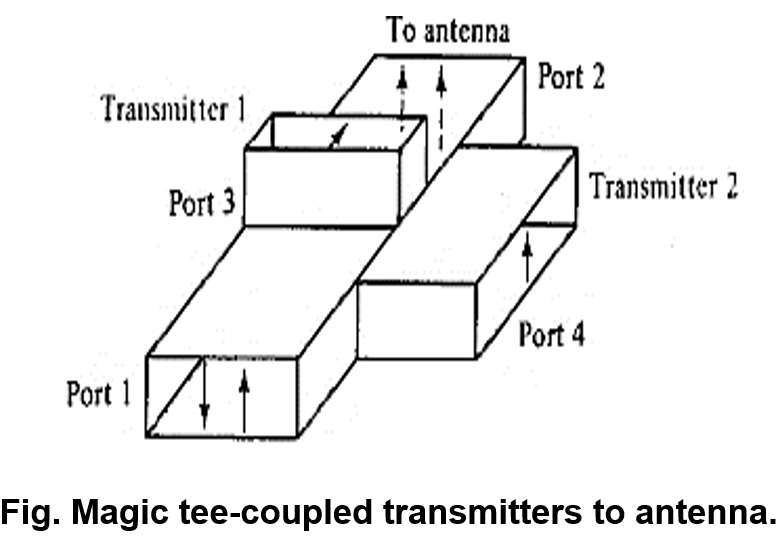 A magic tee may be used to couple the two transmitters to the antenna in such a way that the transmitters do not load each other. The two transmitters should be connected to ports 3 and 4, respectively, as shown in Fig. Transmitter 1, connected to port 3, causes a wave to emanate from port 1 and another to emanate from port 2; these waves are equal in magnitude but opposite in phase. Similarly, transmitter 2, connected to port 4, gives rise to a wave at port 1 and another at port 2, both equal in magnitude and in phase. At port 1 the two opposite waves cancel each other. At port 2 the two in-phase waves add together; so double output power at port 2 is obtained for the antenna as shown in Fig. A hybrid ring consists of an annular line of proper electrical length to sustain standing waves, to which four arms are connected at proper intervals by means of series or parallel junctions. Figure shows a hybrid ring with series junctions. The hybrid ring has characteristics similar to those of the hybrid tee. When a wave is fed into port 1, it will not appear at port 3 because the difference of phase shifts for the waves traveling in the clockwise and counterclockwise directions is 180°. Thus, the waves are canceled at port 3. For the same reason, the waves fed into port 2 will not emerge at port 4 and so on. It should be noted that the phase cancellation occurs only at a designated frequency for an ideal hybrid ring. In actual hybrid rings there are small leakage couplings, and therefore, the zero elements in the matrix of Eq. are not quite equal to zero.